I love coming up with different ways to prepare turkey – it’s one of my favorites. 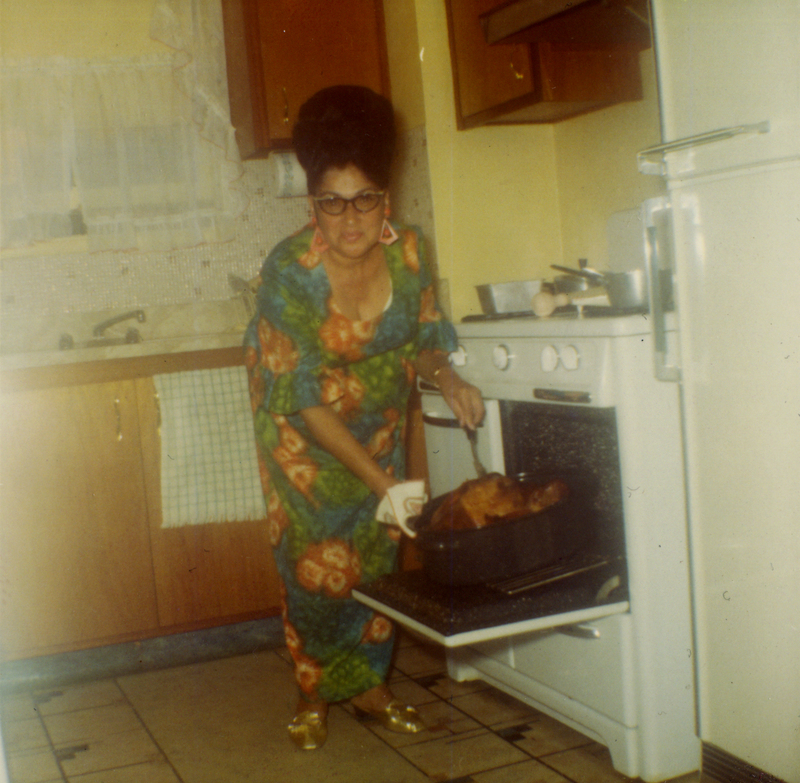 During the holiday I cherished the time I spent in my grandmothers kitchen. The day before Thanksgiving I would help her clean and salt the bird and then we would tie it up by its legs and hang it upside down in the cold, dark pantry overnight. I sometimes couldn’t sleep with anticipation of untying the bird in the morning and stuffing it before putting it in the oven. The following recipe isn’t the one my Grandma would make – this is a variation of a Mexican braise. Mulato chiles – are from the poblano family and have a dark rich and complex flavor with very little heat. They are most popularly used in moles. 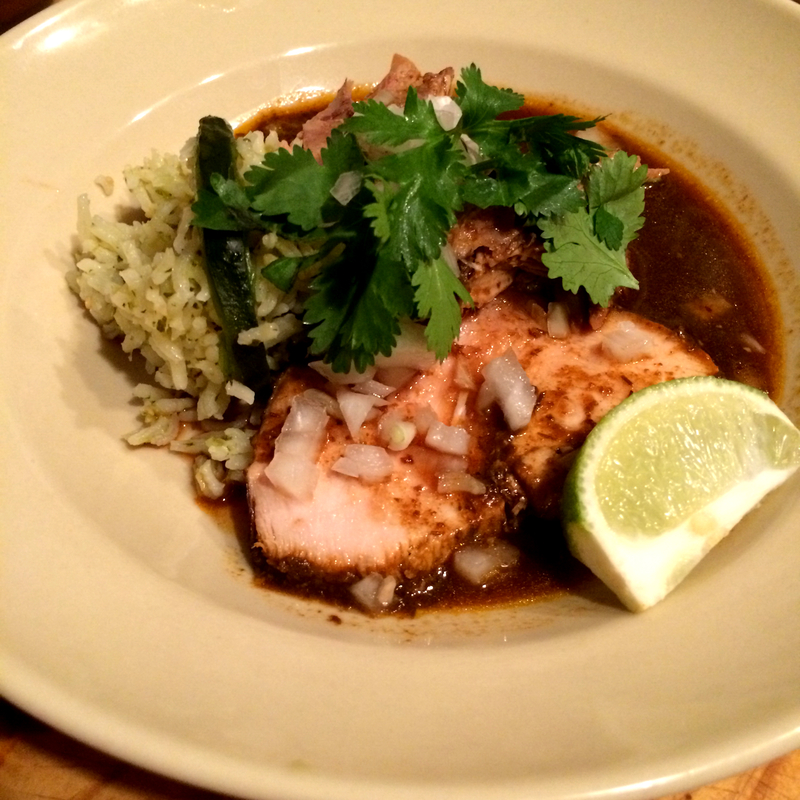 I wanted those flavors in this braise – but not the rich sauce of the mole. Grandma basting the holiday turkey. The day before – heat a heavy pan over medium heat and toast the chilies until they puff. Remove the seeds and stems and soak in 2 cups of hot water for about 10 minutes. Puree together the chilies, garlic, vinegar and cooking liquid until smooth and allow the mixture to cool. Debone the turkey and cut it into six pieces – you can ask your butcher to do this part. Save the carcass for making the stock. Season the turkey pieces well with salt and pepper. Smear the chile paste all over the turkey pieces. Place the legs and wings in a container and refrigerate. Wrap the breasts in plastic and refrigerate overnight. To make the turkey stock roast the bones in a 400* oven with an onion, carrot and celery stick and a couple bay leaves for about 30 minutes. Transfer to a stockpot and add 6 quarts of water. Bring to a boil skimming off any scum and simmer for 1 ½ hours. Strain the stock and cool, refrigerating until ready to use. 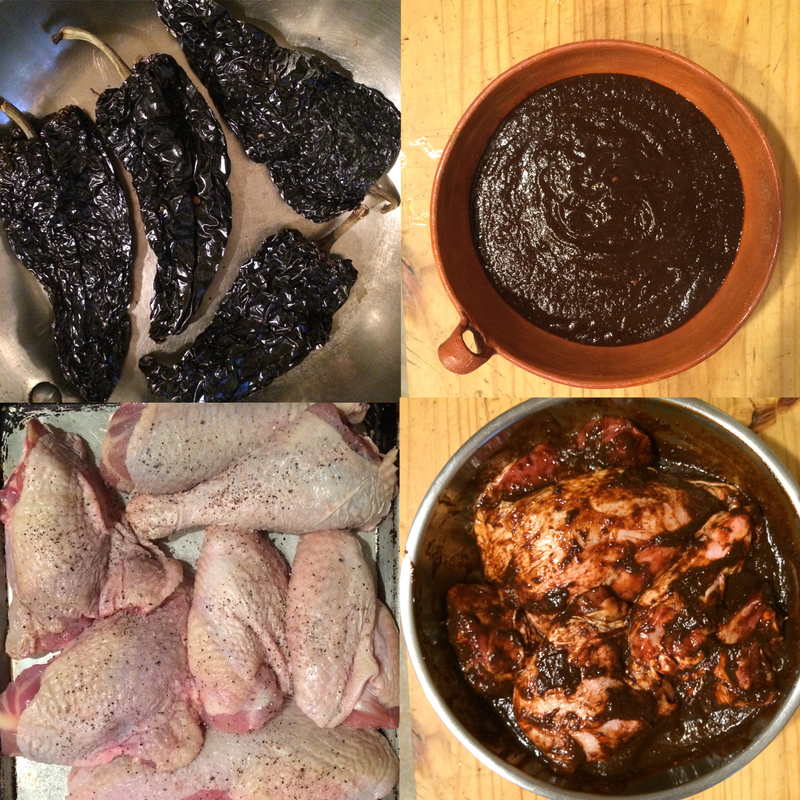 Start braising by placing the turkey legs and wings into a heavy bottomed roasting pan with all of the chili paste. Add the turkey stock, bay leaves, cinnamon stick, cloves, cumin, oregano and onions. Bring the liquid just up to heat, cover and place in a 350* oven. Cook for about 1-½ – 2 hours until the meat is bone tender. Let the braise sit for 30 minutes and skim fat. Meanwhile reset the oven to 375*. Remove the breasts from the refrigerator and allow them to come to room temperature. Roast for 30 minutes and allow to rest for 15 before carving. Pull apart the braised meat and slice the breast – serve with green rice and garnish with diced white onions, cilantro and lime.